What is the use of ValidationSummary in ASP.NET MVC5? How to use ValidationSummary in MVC? Html.ValidationSummary is used to display error message at a fixed and only place. 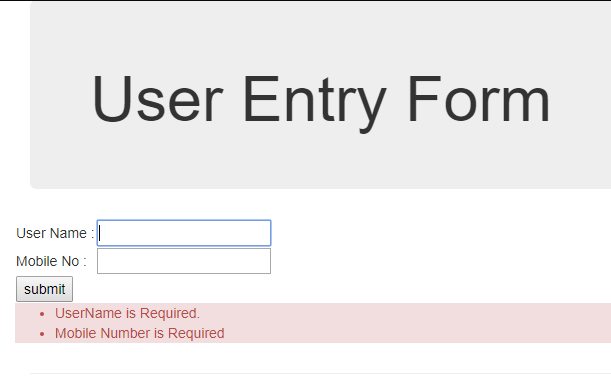 It summarizes all the error, collects them and show them in one place after clicking the submit button. Instead of displaying message next to each control, it is a good practice to show summarize error in a single place using Html.ValidationSummary method in ASP.NET MVC 5 C#. This tutorial explains about Html.ValidationSummary control in ASP.NET MVC. Using the complete programming example, you will be able to understand this topic more clearly. In the next chapter you will learn Encoding in MVC.